On the fourth day of January, 1830, a federal land patent was issued for the west half of the northeast quarter of section 5 in Township 2 North and Range 2 East in Orange County, Indiana. And two things about the transaction puzzle reader Genevieve Netz today. Good questions, and the answer — as usual — comes from the law. Other minor changes followed and many credit sales were made… until the Panic of 1819 dropped the bottom out from under the entire system. Suddenly, there was a shortage of hard cold cash — and individual farmers stood at risk of losing their lands. So what does this mean for our friend Kendall here? The designation on the BLM website of this transaction as a “Credit Volume Patent” simply means it began as a credit sale, under one of the original credit acts, between 1800 and 1820, and was recorded as such. And the reference to Thornton Kendall as the “Assignee of Jesse Ferguson” means only that Ferguson originally filed for the land and, somewhere along the way, Kendall secured the same rights to the land that Ferguson would have had if he’d completed the transaction. The phrase, by itself, doesn’t tell us how it happened that Ferguson’s rights ended up in Kendall’s hands. It might have been, as Genevieve suggests, that Kendall took over the payments and so acquired ownership of land that Ferguson had originally arranged to purchase. But it could have been anything from Ferguson selling his rights to Kendall, to a court ordering the transfer because Ferguson owed Kendall money, to Ferguson losing the land to Kendall in a card game. In other words… more research to do! “United States Bureau of Land Management Tract Books, 1820-1908,” images, FamilySearch (https://familysearch.org/pal:/MM9.3.1/TH-1971-32471-9454-63?cc=2074276&wc=M7WS-724:356163201,356218501 : accessed 15 May 2014), Indiana > Vol 2 (Jeffersonville) > image 17 of 591; citing Records Improvement, Bureau of Land Management, Washington D.C. The information in the entry at the top of this page (actually it is spread over two pages, but both are included in this one image) gives an abbreviated history of the events which led to issuing final certificate number 2534. I’d forgotten that those tract books were online. Sure makes you wonder exactly what happened after January 1817, doesn’t it? Thank you for addressing my questions and explaining the various credit acts. I had not realized that land was so expensive. I guess that explains why people got so excited about homesteading when the government came up with that idea later on. I have another ancestor from Indiana (Eli Scotton) whose name appears in a similar land transaction. An 1819 GLO record (credit volume patent) gives ownership of 160 acres in Fayette County to “Archibald Pruitt, assignee of Eli Scotton.” In that case, I’m pretty sure that Eli Scotton was deceased before 1819. Kathy Nitsch, I did not know those records existed. I foresee spending some quality time with them! I will transcribe the record at your link so I can understand it better. Of immediate interest to me when I scanned over it: “William C. Griffith of Nelson County, Kentucky.” Thornton Kendall came to Indiana from Nelson County. Further research can be done using the land entry case file which can be obtained from the National Archives. It is a bit pricey when ordered online, especially if the file only contains s few receipts. Sometimes a file contains much more than receipts. A researcher can be hired to photocopy the contents of the file if you prefer. For any cash or credit sale, I’d definitely go the route of hiring someone to get the file (and everything else you can think of that you might need at NARA at the same time). It’s much more cost effective. para 14 ” minimum prize to $1.25″ I assume you mean price. Yep, you’re right — and it’s been fixed. Thanks for letting me know! 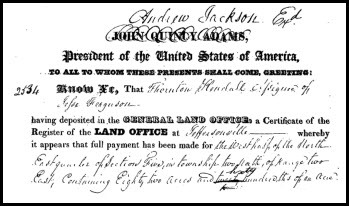 When ordering land entry files from National Archives, is it necessary to order Assignee and Assignor records separately? I ask because the order form ask for name of entry man. Generally no. It will be one record, with multiple names (such as warrantee and patentee, or assignor and assignee). You’ll know by checking the BLM website and seeing if it’s the same patent number. This has been a really helpful article. I was able to find my great-great-grandfather Philip Clipp’s record in the land tract book. But there are additional entries on the pages that I don’t understand. Can you help explain them? Thank you! What data are you not understanding?